08/04/2015: Rash makes a cameo in Killer Instinct! Killer Instinct Season 3 is on the way (March 2016 to be exact) and who else to lead the party than our beloved BattleToad, RASH! from today (07/04/2015) til September 8th you can beta test him if you own either Killer Instinct or the newly released "Rare Replay" collection. More information on the Ultra Combo website! 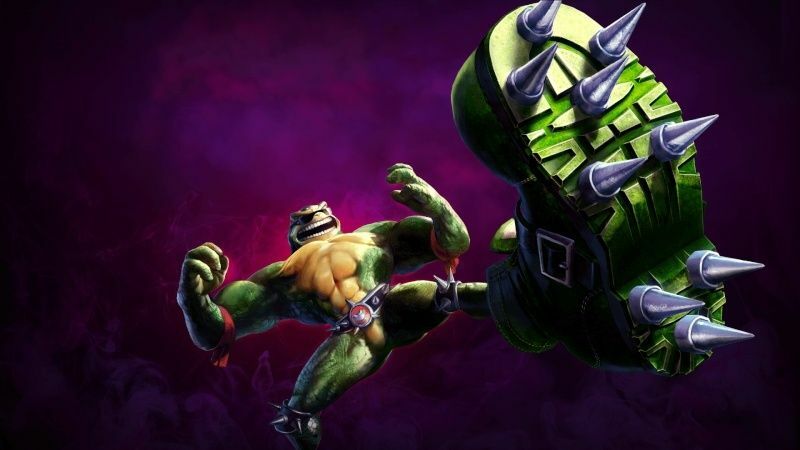 Rash can automatically perform combos by mashing Light Punch or Light Kick. He even automatically recaptures the opponent if they are airborne! How cool is that?! Rash bashes opponent with an overhead attack, leaving them with a severe headache! Rash is always ready for a fight and runs towards his enemies. Rash can zipline in any direction when his tongue makes contact with a wall or opponent. Wicked Tongue can also be used to eat most projectiles and gain Shadow Meter. Om nom nom nom! Rash kicks the opponent in the face with a spiked big boot. Respect the Boot! Rash morphs into a wrecking ball and swings across the stage. Causes a wall splat against grounded opponents, and a hard knockdown when the opponent is airborne. Has 1 point of armor because he’s one tough dude! Rash sprouts ram horns and charges towards his opponent. Summons a Speeder Bike from out of nowhere! Damages the opponent on impact. Wreck your Speederbike? No problem! Rash can summon another one by pressing HP+HK again while in Instinct.